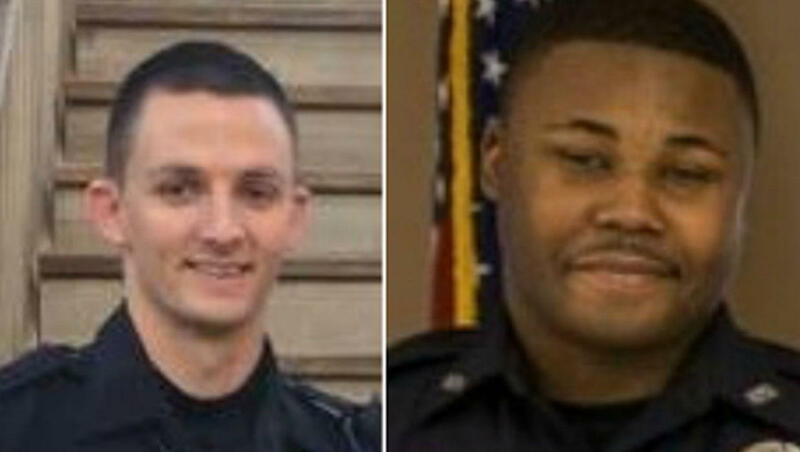 BYRON, Ga. -- A man who shot and wounded two central Georgia police officers who were serving a search warrant early Monday was killed during a shootout with police officers, an investigator said. Georgia Bureau of Investigation Special Agent in Charge J.T. Ricketson said a multi-jurisdiction drug task force went about 2:30 a.m. Monday to a home on state Highway 42. Officers knocked on the door and announced themselves, but no one answered. “They knocked on the back door and announced their presence and that they were performing a search warrant,” Ricketson said. “No one responded so they gained entry by going through the back door. As the officers were entering inside the residence, an occupant inside the residence fired at least one round. It may be more,” he said. The officers returned fire, and the suspect was killed, he said. CBS affiliate WMAZ identifies the officer who underwent surgery as James Wynn, 27, a four-year veteran of the force. He was shot once in his vest and in his left arm. Wynn is expected to make a full recovery and is “looking good,” Lt. Bryan Hunter told the station. Officer William “Will” Patterson, 26, was treated and released from the hospital. He was also was wounded in the left arm. He’s been with the department for just over a month, and previously worked for three years at the Fort Valley police force, Hunter said. Ricketson identified the deceased man as 31-year-old Rainer Tyler Smith. The man’s girlfriend and an infant, about one month old, were also in the house at the time of the shooting but neither was harmed, he said. GBI agents have locked down the scene and were securing search warrants. Ricketson said the officers are part of the Peach County Drug Task Force that includes officers from Peach and Crawford Counties, Byron and Fort Valley. The shooting comes at what has been a dangerous time for law enforcement officers in Georgia. At least seven Georgia law enforcement officers have been killed by gunmen in the line of duty this year. Most recently, two police officers were shot responding to a domestic dispute call at an apartment in rural Americus last weekend. Americus Officer Nicholas Smarr died Wednesday and fellow officer and lifelong friend Jody Smith died the following day. The suspected gunman was found later - apparently of a self-inflicted gunshot wound - inside a home where he was hiding.